A hypothesis! Snow-by-Night must balance her elements and become more like Elemental Gold for her to find her heart. And Blaise is the path to do that. The experiment reminds Blaise of something far away and long ago as you can see when you vote for Snow by Night on Top Web Comics! My hernia operation was successful and now it’s time to take it easy and give the muscles time to heal. This does meant that I have lots of time to work on scripts. I finished the vignette for Ch16 last night! Woo! That finishes up Volume 4. Now it’s time to start outlining Volume 5. “You have the fire she needs to become a woman”. No innuendos intended. Also, does it means both Blaise and Jassart are connected to Fire? Well, his name is indeed “Blaze”. That is as fire-y as it can get. guh, fire bending is the hardest one to master. Air, until Earth has taught it to anchor itself and say “No, you move”, feeds Fire. Water, until Fire has taught it to commit everything it has to one move, is stirred into a storm by Air. Earth, until Air has taught it to bend and flow, is broken and eroded by Water. Fire, until Water has taught it to move in every direction at once, is smothered by Earth. Hang on, though. Wasn’t fire super easy for Aang to pick up? Jeong Jeong handed him a smoldering leaf and he was able to conjure and (kinda) control fire within seconds, kind of like water. On the other hand, learning even a little earthbending took an entire episode of instruction from a master and a dramatic motivation. But then, in the end, will she still be Snow-by-Night? No, she will be Mrs. Blaise, obviously. I’m waiting for him to suggest a massage. And she’ll basically have to become human to ‘find her heart’, this is very mythy, you know. awesome! most comic creators take post-surgery hiatuses. but for you, a time to produce more – nice! many, sure, but not most of the comics i’ve followed, which are mainly fantasy and sci-fi. i can’t count the number of creators who had a baby, got some other (non carpal tunnel condition) diagnosed, or had a tragic event in their personal lives that either created an interminable hiatus or, in many cases, permanently halted the story. i can relate to retreating and hibernating during such times, and do not feel judgmental about it, only compassion. some had really minor surgery, only taking a recovery hiatus got them out of the habit and routine, which led to a loss of interest. in any case, i’ll be grateful the one time the end result is the opposite effect. The scary one was back in January when I thought I had pancreatic cancer. I managed to dodge that bullet. *WHEW* So I’m more determined than ever to make Snow by Night an incredible story and to finish it. I think I’ve spotted a minor continuity error. 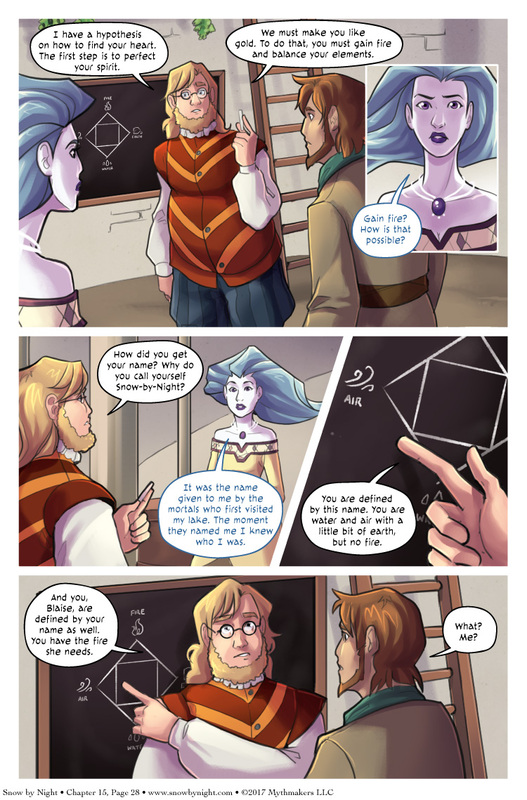 In chapter 3 page 7 Snow-By-Night says that she was given her name by mortals, which contradicts what she’s saying in this page. Either she lied then or now, or canon has changed in 12 chapters since. Sorry if I’m being nitpicky. I was just re-reading your wonderful comic, and I noticed something I wanted to share. Hmmmmm. Yep, that’s an outright contradiction. I forgot I had said that back in Chapter 3. Snow is not lying here or there, so I’ll update this page to make it consistent. Thank you for bringing it to my attention. Gold star!